What Makes a Good Baby Laundry Detergent? Do I Really Need “Baby” Laundry Detergent? Are you a new parent? If so, welcome to the world of dealing with epic mountains of laundry! There’s clothing, bedding, towels, bibs, car seat and stroller covers, and more. If you decide to cloth diaper, then you have THAT to deal with too. If you’re concerned about which detergent to use on your little one’s laundry, you should be. You’d be amazed at the kind of chemicals and irritants that can be found in detergents like Tide. 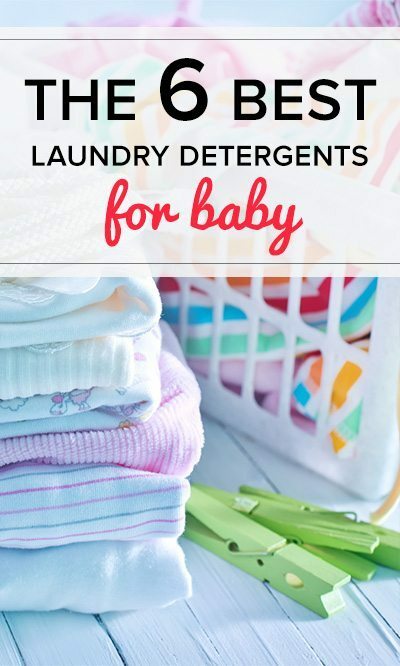 In this guide, I’ll tell you my top 6 baby laundry detergent recommendations and why I like them. Below I’ve listed 5 excellent detergents that are safe, chemical-free, non-irritating and have no nasty chemicals that can irritate delicate skin and cause allergic breakouts. 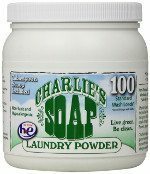 On first glance, you might mistake this for an industrial soap, but the fact is that Charlie’s Soap (click here to check price on Amazon) is one of the best detergents for babies out there, bar none! It’s my absolute favorite, and once I used it for the first time, I never looked back. And if you’re not using it yourself yet, what are you waiting for? This stuff is great, safe (non-toxic and chemical free) and works really well. In fact, many cloth diaper manufacturers recommend it to clean their diapers. It’s one of the purest detergents you’ll find: it has no fragrance, no chemical brighteners, it’s biodegradable, non-toxic and non-irritating, and safe for the environment. You’ll find that the detergent itself does have a bit of a smell, but the clothes come out completely odorless, just the way you want them. All in all, Charlie’s Soap is excellent and what I’d definitely recommend for your baby’s clothes. If you’re like me, you’ll get it for them, but soon you’ll find yourself washing ALL of your clothes with it – it’s just that good. Biokleen (click here to see the price for a pack of 6) is another excellent chemical, fragrance and dye-free detergent that’s gentle on baby’s skin and an all-around excellent detergent for all of your family’s clothes. While it’s not my favorite, it’s still excellent and you can’t go wrong if you go with it instead of Charlie’s Soap. Like Charlie’s Soap, your baby’s clothes will come out smelling like nothing at all, and that’s a good thing. I don’t know about you, but I don’t exactly like my clothes smelling like artificial flowers or outdoorsy smells, and I certainly don’t want it on my baby’s clothes. This detergent lasts forever, too. You don’t have to use much at all per wash, and it comes in a huge 64 ounce container. If you do laundry 4 times a week, one container will probably last you nearly 2 months. If your child has sensitive skin or eczema, this can be a great solution to it. Eco-Me (click here to check price on Amazon) is an all-natural laundry detergent, which has none of the nasty stuff you want to avoid. You’ll find no dyes or colorants, preservatives, perfumes or sulfates. It’s made from natural food-grade and plant-based ingredients. Eco-Me makes several detergents with fragrance, but I chose the one that has none. Your clothes will come out smelling like nothing at all, just the way they should. You might also be happy to know that this detergent is not tested on animals and is both PETA and Leaping Bunny certified! Now, this detergent works best on lightly-soiled clothes. It will work on spit-up and poop stains, but don’t expect it to work wonders on deeply-embedded dirt and grime stains; those might take a few washes or something stronger. However, it’s absolutely perfect for baby clothes and delicates! Like all good detergents, Seventh Generation Free & Clear (click here to check price on Amazon) is free of all of the nasty stuff. It’s biodegradable and made almost entirely (96%) from plant-based ingredients, so not only is it good for you and your child, but it’s good for the environment too! Unlike Eco Me, this is a very effective detergent that will remove soiled stains like poop and spitup. It’s concentrated, and you’ll get about 50 loads per bottle, which is pretty decent. It gets diapers clean, and in the world of green and natural detergents, Seventh Generation works REALLY well compared to many others. One downside is that they made the cap difficult to read; it’s a clear cap and the markings are in the plastic. Once you get used to it you’ll know where to fill it up to, though. 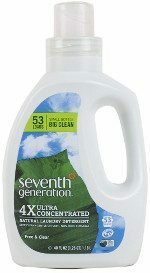 That issue aside, Seventh Generation makes an excellent detergent that’s perfect for your baby’s clothes and diapers. Method (click here to check price on Amazon) might be a company you’re familiar with. I’ve been a long time fan of their products, especially their awesome, non-toxic surface cleaners. When I saw that they had a free & clear laundry detergent, I had to try it. And it’s amazing! I’m not sure if it would work on cloth diapers, but it does work on grass stains, spitup and other similar stains. My only gripe with Method’s product is that it does have added fragrance. This isn’t exactly ideal, but I love their product so much that I have to let it slide. Other than that, it’s a great, natural plant-derived detergent that I would recommend to anyone! 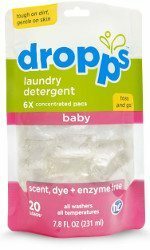 Rounding out my list of the best baby laundry detergents is Dropps (click here to check price on Amazon), which are washer sacks that you simply put in with each load of laundry. While you do pay a small premium for these detergents sacks, you make up for it in convenience. You don’t have to measure powders or liquids; you simply throw a detergent sack in with your laundry, and you’re done! The great thing about this is that you don’t have to lug around heavy boxes or bottles of detergent, too. When I was pregnant, I was SO glad to have a bag of Dropps. You’ll be amazed at how light the package is when you hold it in your hands! Like all of the others on my list, Dropps are free of perfumes, enzymes and dyes, and are gentle on clothes and delicates. They’re great for delicate skin, and shouldn’t cause any kind of skin irritation. If you have a high-efficiency washer, this is perfectly compatible with it, too. The only thing that you should keep in mind is that these will melt if they get too warm, so keep them in a cooler place. Detergent pods are obviously not for everyone, but if they sound appealing, you really can’t get any better than Dropps. Why regular laundry detergent is no good. Sure, detergents like Tide get your clothes clean. I can’t deny that. But the problem is that ALL laundry detergents leave a residue on the clothes after being washed, even if you can’t see it. This residue can cause a multitude of issues, such as eye or skin irritation (which is even more likely on a child’s delicate skin), endocrine disruption, and allergic breakouts. Why subject your child to this? I sure wasn’t going to. Especially since you can avoid it and get MUCH better, safer and healthier detergent for basically the same price! So, now you know that regular laundry detergent is just no good for your little one (or you, for that matter!). What do you do? Luckily, there are several great, healthy and effective detergents on the market that are free of all of the chemicals and additives you’ll find in mainstream laundry detergents. What makes a good laundry detergent for babies. There are 3 key characteristics of a good detergent to use on your little one’s clothes and diapers. Any good detergent is free of these chemicals and fragrances, and all of my choices fit this criteria. 1. Is gentle on your baby’s skin. Since babies have much more sensitive skin, they’re also more susceptible to outbreaks and baby eczema caused by these detergents. 2. Is free of toxic chemicals & fragrances. Any good, safe detergent won’t contain any of this junk, and none of the ones I list will either. 3. Is effective on baby-stains. Let’s be real: you need a detergent that’s effective. Poop, pee and puke stains are going to be a daily enemy, and you might be worried that natural detergents aren’t going to be an effective fighter of these stains. All of the detergents I list will be effective stain fighters, capable of washing even the most poopy or pukey of baby clothes. Most detergents that are specifically labeled as being “for babies” are a total rip-off. In some cases the manufacturers actually bottle the exact same product as their regular detergent, slap a “baby-safe” label on it and charge you more! Don’t waste your money on what is labeled as “baby laundry detergent” like Dreft. All you’ll do is pay a premium for detergent that really doesn’t work all that well, and certainly isn’t better for your baby! You’re much better off getting one of the great, natural and free & clear detergents I list below. The bonus is that they’re much more cost-effective, and you can wash the whole family’s clothes with them! 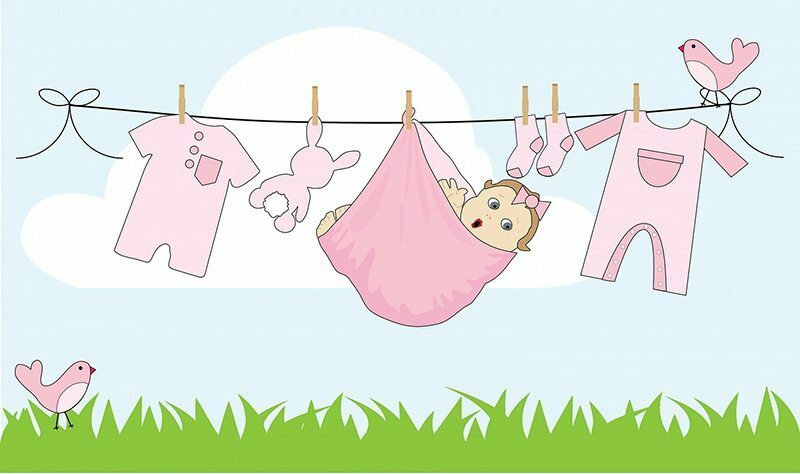 You should always wash any item of baby clothing before your baby wears it, since newborns have sensitive skin and clothing can have irritants before you wash it for the first time. Put socks and any other small items in a mesh bag. Fasten up any hooks or loops that might get caught on something and damaged. Read the labels: most baby clothing is fire-resistant, and bleach can reduce the fire-retardant qualities, so never use bleach on these items. Wash clothes at 85-105 degrees temperature; going for the lower end will obviously save you some money. Feel free to wash baby clothes with a full load of laundry if you’re not using special baby laundry detergent. It’s inevitable that you’re going to end up with stained clothing or bedding at some point in your baby-raising adventures. Here’s how you can tackle those stains. Clean the clothes before they stain: The best way to deal with stains is to get them before they even happen. Protein stains (breast milk, formula, food, spit-up, feces): Soak the clothes in cold water with an enzyme-containing product. Urine: Take one tablespoon of ammonia and dilute it into one cup of water. Dab a little bit of the mixture into the clothing to make sure it isn’t going to remove the coloring, and if so, treat the stained area with it. Baby oil: Use a stain remover product and wash the garment in the hottest water that you can, using the wash care tag as a guide. Fruits & Veggies: These can be tough, but try this: rinse the garment in a 1:1 mix of rubbing alcohol and cold water, and then launder as normal. If this doesn’t work, you can try using a stain remover before washing. Finally, if the stubborn stain still won’t go away, you can try washing with a 1:1 vinegar to water mix. Unfortunately, these can be hard to come by in stores like Walmart and Target. I’ve found that the best and easiest way to find them is online. I personally recommend looking around Amazon; you can find links to all of our top 6 choices in the list right here. My wife has been looking for a good laundry detergent for our new baby. You’re right, the amount of laundry she does is like a mountain! We really like your list of good detergents for babies. We’ll be sure to keep them in mind as we find a good one for ours. My son has very sensitive skin, and I want to avoid using any laundry soap that may give him a rash. Your list of baby-safe detergents is very helpful. It’s great that there are a handful of companies who keep children’s needs in mind and produce safe, quality products. I’m glad you found the list helpful, Ellen! Let me know if you have any questions. You put together a pretty good list of baby safe detergents. I tried dreft but it didn’t really get all of the stains out of my babies clothes. I think we may try the seventh generation detergent. My daughter has very sensitive skin keeps getting rashes welts all over her body does anyone recommend one laundry soap over the other? I use seventh generation free and clear– I didn’t know they had a baby version. Do you know what the difference is? My boy is a VERY messy eater, and I have the hardest time getting out food stains. Thanks for the tips- I’ll give them a try!! What’s an example of “enzyme-containing product” to wash off protein stains? Pretty much anything that’s supposed to be a “stain remover” has enzymes! Excellent. Just what I was looking for. I will have to give these a try. I will let you know how they work out. Is Charlie Banana the same as Charlie’s Powder? They sell Charlie Banana at Babies R Us so I’m wondering if it’s the same as the Charlie’s Powder you’re talking about above or if it’s a completely different company? Amy, I don’t believe it’s the same company. I looked into it, and it seems as though the two detergents have different ingredients. It’s confusing, because it looks like they both use the same packaging, too. Have you tried soapnuts? Thoughts? I haven’t, but from what I’ve heard they don’t work all that well. Thank you I been using dreft and I realise my baby getting rash all over , so I will try one of those products you list.. Don’t afto buy it on amazon? Wouldn’t risk Oxy Clean. As good a stain fighter as it is, it can irritate skin if not completely rinsed out properly. And even then, I’d stick to 3% hydrogen peroxide itself & a little baking soda here & there, still thoroughly rinsing.